HPI Baja 5t – is it real? 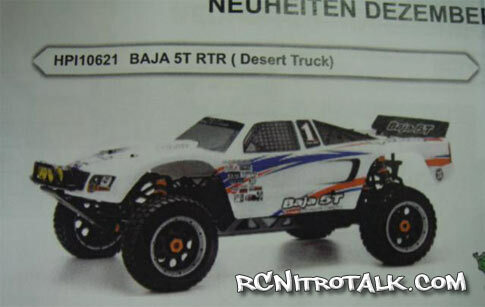 Could it be, a HPI Baja 5T? Are these photos even real? By the looks of both photos these look to be very real and judging by the looks of the photos, the HPI Baja 5T is built on the popular HPI Baja SS chassis with a few minor changes to accommodate the full size truck body, extended front bumper and wheel and tire changes. Sadly according to the photo it’s still going to be 2WD which is a shame. Large scale RC has been going crazy for a 4WD 1/5th scale by any of the major RC manufactures but none has delivered. Or at least not yet, rumors are also flying around that there is another large manufacture that has a 1/5th scale RC of their own that’s in the works. Either way you can be sure RCNT will be the first to let you know as more information is known! 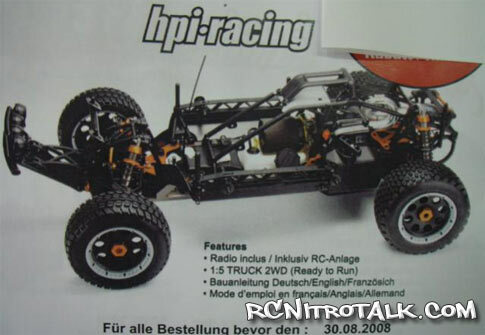 Come talk about the possible HPI Baja 5T in our Large Scale RC forum.